I recently had an opportunity to take a hastily-planned trip to India (among other places) over the past few weeks. I’m back now, and have uploaded some of the pictures I snapped along the way, if anyone is interested. You can find them here. Starting in Delhi, I did the “Golden Triangle” of Delhi, Agra, and Jaipur. 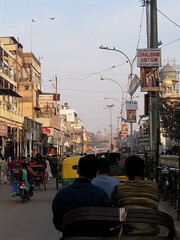 My time in Delhi was spent mostly in “Old Delhi”, around the Chandni Chowk and Jama Masid. Among the many things I learned is where all of our old college textbooks went to die, that street cooked dosas are most excellent, and that I should never ever complain about DC traffic again. The hotel was the Maurya Sheraton, which was quite nice, but sort of in the middle of nowhere. Its most recent claim to fame was hosting Bill. 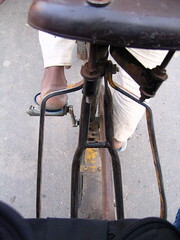 With a car and driver, I then headed down to Agra. It was on this trip that I learned that insane drivers and awful roads aren’t particular to Delhi, but rather part of the national character. Speaking as someone who has traveled and driven all over the world, there is no way I would ever ever get behind the wheel of a car in India. 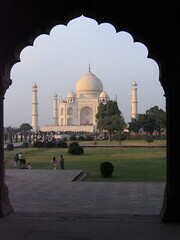 Agra is home to the Taj Mahal, which is not to be missed. I’ve never come across a tourist attraction that so easily surpassed its hype. It was breathtaking. On the way to Jaipur, and on the recommendation of a number of friends , I stopped at Fatehpur Sikri. The once and brief capital of the mughal empire, the palace was a very interesting manifestation of Emperor Akbar‘s openness to the major faiths (tho’ one wonders whether this was the result or the cause of his having wives from each of them). Driving in and out of here, I experienced the rather unexpected phenomena of would-be guides actually jumping in front of the car to get us to stop and hire them as a guide. You just ran down my car, scaring me half to death, and now you want me to pay you to spend time with me? Sure. Many (many) hours later, I ended the day in Jaipur, the “pink city” (the result of a promotional hospitality effort that’s lasted nearly 100 years now . . .). After congested Delhi, and hazy Agra, Jaipur was literally a breath of fresh air (this despite many of the streets being full of elephants). My guide here, Khiraz, was a remarkably overeducated fellow with a love for Jaipur that was infectious. 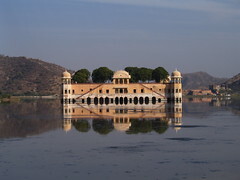 He was also curiously into astrology, which set off a rambling debate that took place between seeing the sights of the Hawa Mahal (nifty), Jal Mahal (it’s good to be king – build the palace and then flood the valley – just because you can! ), and catching a glimpse of Bollywood star Aishwarya Rai shortly after she filmed a segment nearby (an excitement that was completely lost on me, I’m afraid). 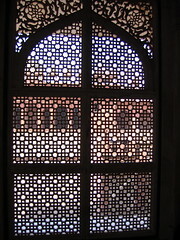 Home base in Jaipur was Alsisar Haveli, which I recommend to anyone passing through in the future. It’s a very nicely converted heritage property. If you’re feeling spendy, stay at Rambagh Palace. I spent my last afternoon there, sitting under a lazily spinning fan on a terrace overlooking the polo fields, martini in hand. Could have done that for a week. 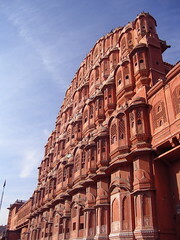 I left Jaipur for Mumbai on Jet Airways. Jet Airways, on this flight at least, put most US domestic carriers to shame. Quick seating, plenty of room, and a hot meal, all for a 90 minute flight at a reasonable price. And speaking of 90 minutes, 88 of them were taken up by the woman sitting to my right. She and her daughter had just come back from a couple of weeks in Pushkar. She was only a couple of years older than me, and the conversation started out very well. It morphed, however, into her telling me how, in 2011, something was going to happen to the world where everyone gave their material possessions away and everyone would live on love. That and the US was a hateful place that should be abandoned. These were the reasons she gave in trying to convince me that I should go to Nepal and meditate for a couple of months instead of heading back to DC. Just trust that things would turn out okay, she said. A bit of googling once I’d arrived in Mumbai revealed her trust-fund kid status. Dad founded one of the biggest private equity firms around. Still, she seemed a decent, if not entirely well grounded, person, and the thought of a couple of months in Nepal did appeal. But as you can see, I’m here now. For the time being, anyway. But back to India. Specifically, Mumbai. Or is it Bombay? I’ve not decided where I stand on the matter, yet. I wasn’t in Mumbai long. Just enough to poke around a bit, checking out Colaba, Chowpatty Beach, and the markets in the Fort and Churchgate areas. One unexpected pleasure was getting into the High Court, situated in a massive Victorian-era stone building complex (where, according to the Lonely Planet book, one of the high-up carvings is of a one-eyed monkey holding the scales of justice). After assuring the 17 security guards that stopped me (only white guy in the entire building) that I would not take any pictures, I found a few interesting courtrooms, and listened to a contract dispute case, an appeal of a zoning fine, and some criminal motions (by far the most amusing)). On the way out, I got of a glimpse of the public defenders office. It was straight out of Dickens. I am fairly sure that some of the open case files in there involved prosecutions brought on behalf of Queen Victoria. After all this travel, Mumbai was the first place where I’d managed to work up some blisters, so at the end of the day, I just wanted to sit down and have a drink. Taking a friend’s recommendation, I’d booked a late table at Indigo. This is Indigo. Now, I give this link to point out that I’m not heading to some shabeen in a basement. I get there, sit down, and order my standard. Martini, Grey Goose, up with a twist. Very nice wait staff whisks away with my order. And a few minutes later another waiter comes up. Turns out he’s the bartender. Umm, no. Seriously. I don’t care how much it is. Dude. (I am embarrassed at the use of the word dude, but I’m a little surprised that I am having to fight to pay them too much money for a drink) Are you really telling me you won’t let me buy a Grey Goose martini? Just make me a martini with Grey Goose. I do not care how much it is. He looks at me as if I just asked for the golden fleece to use as a napkin. I get my martini. Properly made. It is $12. 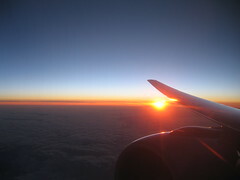 The next day, I fly to Dubai. Highlights from there (one of the best bar views in the world, construction sites creating a distopian anime-looking world, and underemployed Russian hookers) and points further in a future entry. I should probably devote some time and energy to making a living for a little while, now. Still moving . . .
just in a different world.